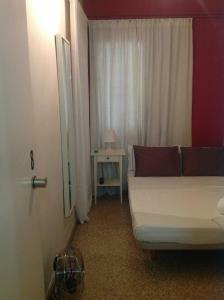 Just 50 metres from Plaza de España Square, Plaza Spain Guest House offers rooms with free Wi-Fi. 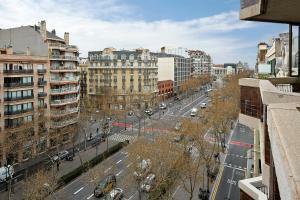 It is set on Gran Vía and is within 5 minutes’ walk of Plaza España Metro station, which is just 3 stops from Las Ramblas. Each room at Plaza Spain Guest House has simple, modern décor. There is heating, a TV and access to a shared bathroom with a hydromassage and chromotherapy shower. Cafés and bars can be found around Plaza de España and Gran Vía. You can find a range of different restaurants in the nearby Poble Sec district, and around Las Ramblas and the Gothic and Raval quarters. You can reach the mock-Spanish village, Pueblo Español, the Mies van der Rohe Pavillion and Montjuïc Mountain in just 15 minutes by foot. From here you can walk up to the Olympic Village or take a cable car up to Montjuïc Castle. The Fira de Barcelona Convention Centre is just 5 minutes' walk away. Several buses stop on Gran Vía and the airport shuttle bus can be picked up at Plaza de España. Sants Railway Station is just 2 Metro stops away. Please note that arrivals before 13:00 and after 21:00 are subject to a surcharge of € 20. 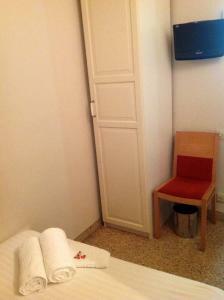 This room has simple, modern décor, free Wi-Fi, heating, a TV and access to a shared bathroom. 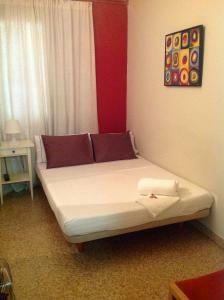 Rate: € 72.20 ... € 75.43; select dates below to get current rates. 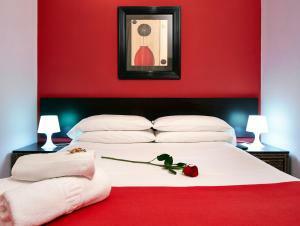 Rate: € 30.00 ... € 98.00; select dates below to get current rates. 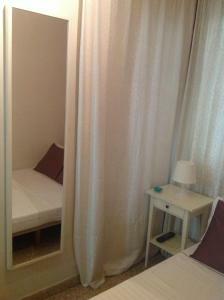 This interior-facing room comes with 1 double bed and a shared bathroom.